The bar at 1882 Bar & Grill. 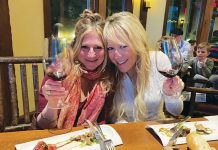 I recently had the pleasure of eating at Truckee’s newest restaurant, the 1882 Bar & Grill, located at The River Street Inn. Innkeepers Matt and Wendy Brown were ready for a new venture and recognized that their riverfront property would be an ideal location for a place to eat. “The property was built in 1882 hence its name,” Wendy explains. I started by tasting Wendy’s current favorite drink off the cocktail list, The Skeleton, prepared with Sky Vodka, agave nectar, fresh cucumber, lime and mint topped with a splash of soda water. It was light and refreshing. The cocktail list has a variety of drinks with entertaining names such as the Train Wreck, a tequila cocktail, and the Dark and Stormy, a rum drink. The Cajun Style BBQ Shrimp appetizer. Wendy suggested I begin the meal with a Cajun Style BBQ Shrimp appetizer, which was excellent. 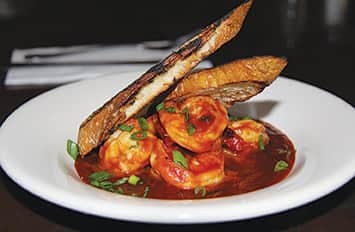 Chef Ryan Odom prepared the shrimp in Negra Modelo beer and scallions, and bathed the shrimp in a tasty barbecue sauce that was tangy, spicy and had just the right amount of kick. The Pulled Pork Sandwich with Mac and Cheese, Onion Rings & Coleslaw. Hints of Chef Ryan’s Mississippi roots are anchored in the flavors of the cuisine served at 1882. 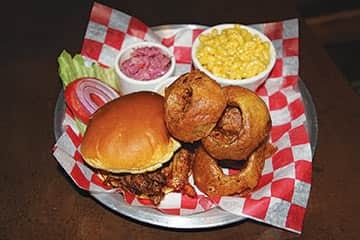 Wendy arrived at the table with a Pulled Pork Sandwich, a creamy side of Mac and Cheese, Onion Rings and Coleslaw. The sandwich was served with a sauce, called ‘Come Back Sauce,’ as in “Y’all, come back now.” The sauce accompanied the housemade, smoked pork, which was creamy with tasty, spicy goodness. New Orleans Beignets served with raspberry dipping sauce. As the restaurant filled, I moved to the bar where I shared dessert with local resident Chris Clark and his friend Casey who had come in for dinner. 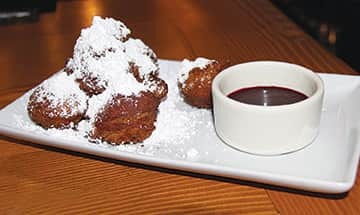 I ended my meal with traditional New Orleans Beignets topped with powdered sugar and served with a delicious raspberry dipping sauce. The 1882 Bar and Grill is charming in every way. Matt and Wendy’s children clear tables and chat with the guests. Whimsical art of skeletons skiing and riding motorcycles decorate the bar area. Paintings of coastal California and pen and ink drawings of the local area hang in the back dining area. Pounded copper tables and cowhide settees offer a taste of the West. 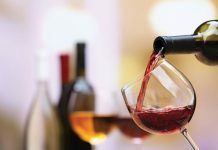 In addition to Cajun Shrimp and Pulled Pork, the restaurant serves Ribs, Tri-Tip, NY Steak, Brisket and Chicken off the pit, along with a variety of soups and salads and side dishes and a children’s menu. 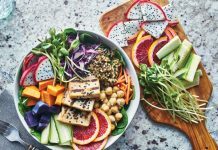 There are a number of vegetarian options, as well. I enjoyed the food and atmosphere of 1882 Bar and Grill. 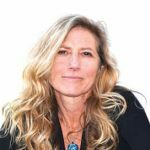 A cozy, intimate restaurant that no doubt will be an amazing place for outside dining on the Truckee River when the weather warms. 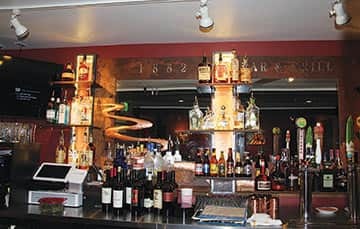 The 1882 Bar & Grill is located at 10009 East River St. in Truckee. For information, call (530) 550-9222.